After making a strong impression in the last two races of the 2013 season, the italian team owned by the Canneori family will field three cars from the first race in Valencia and is working on a fourth one. Convinced of the championship’s potential for further growth, CAAL Racing will field three cars and is working to have a fourth one before the start of the season. In Elite Division there will be Fabrizio Armetta, confirmed after the strong outing in Le Mans, Eddie Cheever III, decided to fight for the win and to make an important step towards racing in the U.S., and Nicolò Rocca, who, after showing his potential in 2013, wants to stay ahead of everyone in this new season. Simone Laureti, who is approaching stock-cars for the first time in his career, will race in Open Division and share the car with Cheever. The other two Open Division Drivers will be announced later. “We know that the teams already competing and the new ones coming will be very competitive,” said Luca Canneori, CAAL Racing Team Manager. “We put together a very strong line-up and we will try to fight for the win in every race and, if circumstances will allow it, also be contenders for titles and trophies”. “I’m very happy to see CAAL Racing developing as a power house in NASCAR Whelen Euro Series. This is a very professional team and great people with the right racing spirit, perfectly fitting to our values. The driver lineup is very impressive and I wish them all the best for the coming season. 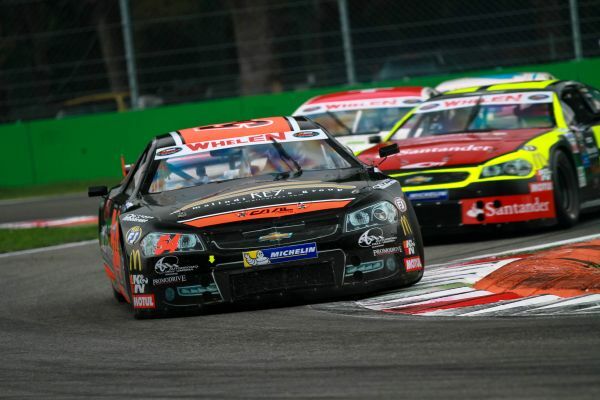 Italian teams and drivers are giving a huge push this year in Euro NASCAR and I’m very happy for Italian fans,” said Jerome Galpin, NASCAR Whelen Euro Series General Manager. Officially debuting in NASCAR Whelen Euro Series for the Monza Semi-finals in September 2013, CAAL Racing was immediately competitive and collected three top-5 in four races in the Le Mans Finals. These results convinced Corrado and Luca Canneori to make the official NASCAR European Series, organized by Team FJ, the main target of their 2014 season. “I would like to thank Jerome Galpin and all the staff for the professionalism, the welcome and for giving us a reliable car, with which, once found the right set-up, we were immediately competitive,” said Canneori. “We strongly believe in this series because it offers great value for money, it is run on historic tracks, the cars are really funny to drive and the crowds are always large. There are also interesting prizes and the possibility, for young drivers coming from karting and open wheels, to pursue a career in the US”. CAAL’s growing commitment promises to make even more exciting the championship that will start from Valencia, on April 12, with an already hot weekend! Tours Speedway – Day 2 An extraordinary atmosphere! Nogaro 200 Ander Vilarino still on top! Promising start for Vilarino and EXOTICS RACING by FJ at Daytona! Ander Vilarino in Daytona – Day 1 : "The feeling is good"
Turin Motor Show, teams, drivers… Euro-NASCAR arouses Italian enthusiasm!